Line a medium bowl with a double layer of fine muslin. Place the yoghurt and salt in the muslin, gather the edges to enclose and use kitchen string to secure. Tie the string around a long wooden spoon and balance the spoon on the rim of a large jar or bowl to suspend the yoghurt, making sure the muslin doesn’t touch the bottom of the container. Place in the fridge for at least 12 hours, or until the labne is firm. Place 1 tablespoon of the oil in a small frying pan over high heat for 2 minutes or until the oil is hot. Add the tarragon and cook for 30 seconds or until crispy. Remove from the oil and drain on paper towel. Remove the labne from the muslin, discarding the excess liquid. 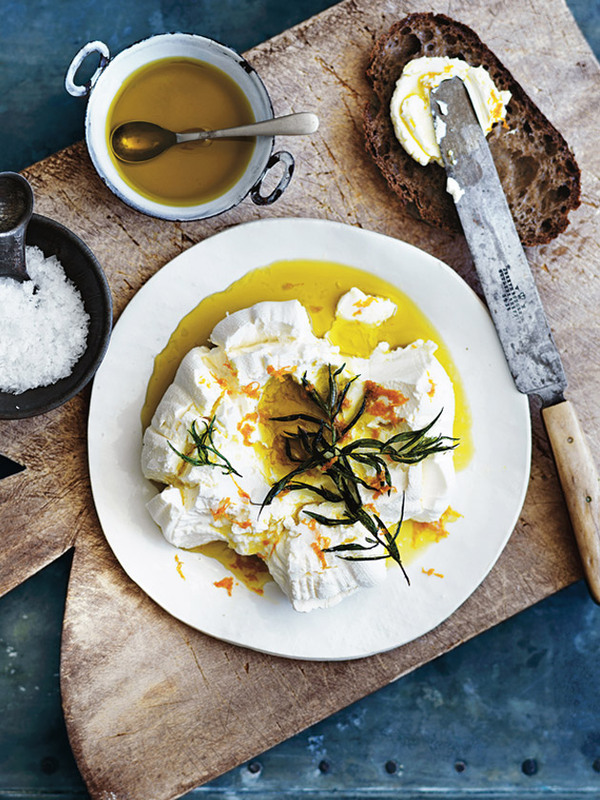 Place in a serving bowl and top with the crispy tarragon, remaining oil, extra salt and orange rind. Serve with crackers. Serves 4.